Since I'm working with analog sequencer I found a problem , sometimes it's hard to synchronize my modular with my daw. So I starting to thing if could be possible to create a bpm clock source.Something like the clock source on the Yusynth Sample and Hold but with two rotary switches for select a BPM, instead a continuous potentiometer. So will be something similar like the standars module, but the selected voltage will drive the IC frequency ( maybe a 555 IC ) . Probably I'm mistaken ( my electronic knowledge is limited ) but will be great to have a module like this to an easy integration of modular synthesizers with a digital recording environment. Also a question wich sequencer you have? does it have a external clock IN? Ideally, you really need a MIDI interface on your DAW/Sequencer. I have a midi interface, so I can make a midi track on the sequencer and take the gate signal , but voltage is not high enough to control the clock input. I've built the Yusynth Sample and hold and the clock out works perfect with my MFOS sequencer. The Yusynth "clock out" has over 10V and the gate signal from the interface is 5V. But when I was thinking about this module I was thinking also to use it as independent master clock. For example if you conect the modular to a FX unit, you could sync the delay FX very easy using the same bpm on the modular. Another uses could be rhythmic patters if you use it with the clock divider. 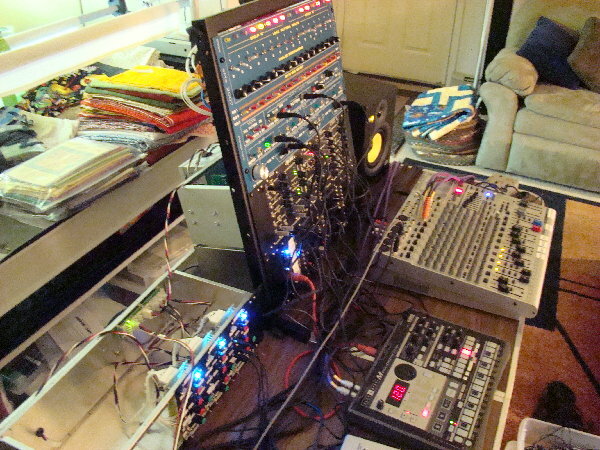 Don't need to be only for synchronize the modular with computer, could have a lot of uses. I have a MFOS 16 step sequencer, and yes, it has clock in. Yes, I think that is a useful idea a clock like that. Actually is a quantized clock. I will follow this thread, i'll think about that. Although for sync different gear, eg the DAW and the modular, I think that it will be better do it under only one clock. For sync the sequencer with the DAW if you have a multiple output sound card you could try it sending to the sequencer pulses of audio. Also maybe it is possible download the threshold of the MFOS sequencer clock input? or amplify the signal input? Thanks for the link Ives, I've been checking it, looks interesting. but getting also much faster clocks in sync to the modular. here is wehre the fun begins. is something like that possible from the technical aspect ? Well, digital controllers are just as adept at doing multiplication as they do division .... It would be a matter of determining the time it takes between the received ticks and just shrinking that time by 1/8, 1/16, 1/32 .... and sending out clocks at the higher rate. Technically, sure, that would not be a too bad to code up for an experienced programmer. When you add din-sync24 and/or din-sync48 out on the same module, this would be a great master-clock. The different module-designers use different trigger-voltages, so adding switches to sellect between 5V and 10V would be awesome. I am a bit confused and I cannot find clear documentation about it (I don't use DAWs or computer for music, only analogue stuff). As a matter of fact, say when you select say 60 BPM with the two rotaries what do you expect to have at the clock output ? A square pulse 0/10V with which frequency is 1Hz (1/60BPM) or 4Hz or 24Hz ? That would be 1 clock each second or 1 Hz. For [4/4] time signature, a measure would then be 4 seconds long when you consider 4 beats per measure. Usually a 1 to 5 millisecond pulse, @ 5V or 10V amplitude will suffice to trigger just about anything. I was confused because I was expecting 1Hz but when I checked what was sent by a MIDI clock programmed set to 60BPM I had a 1Hz blinking LED indicator but a flow of 24 pulses per second on the electrical output. Therefore, in the suggested module for 60 BPM the circuit should deliver 1 pulse per second. This is a neat little programmed PIC chip that reads MIDI Start, Stop, Continue and Clock pulses and outputs a Run signal (gate), a Start pulse (sequence reset) and clock pulses at the MIDI standard of 24 pulses per quarter note. All three signals are available normal or inverted from the ICs 6 outputs. Use it for DIN sync applications or to run analog sequencers. Only a few extra components are needed for the basic circuit. When using this chip, if you feed it a MIDI clock, it will NOT generate any 24 PPQN pulses until it receives a START message from your sequencer. The STOP message will inhibit the sync pulses. I never really saw how stable it was in terms of timing jitter on a busy MIDI bus. I would be interested to see that specification. To thin the data, I use more than one MIDI OUTPUT to share the data load. I really have to agree with this statement by SOUND. Ideally you want one clock source instead of two to synchronize your DAW and Modular. I am leaning towards the digital controller solution to generate clock pulses from MIDI clock data stream. I say this because using a circuit that picks up audio "pips" from your sound card just seems like lots of work to me. This is just my opinion and that really does seem like a cool experiment, and rather clever, but probably none that I would do. I would imagine years ago, a track was dedicated on tape with audio "pips" to synchronize gear? No? Good thread ... I am sure good things will come from it and ZONE in on the module in the original post. Nice Gabba Triggers for free !!! At times when I have no computer in my setup, I use my Korg EM-1 as a master clock source, then go to MIDI2CV and clock my modular and Klee sequencer from that. I usually dedicate one drum track to send out notes either on a regular beat (1/4, 1/8, 1/16, etc ..) OR send out any pattern of notes I wish. Another track is assigned strictly for sequencer RESET or LOAD pulses so that I may truncate sequences on the fly. I can place a LOAD for the sequencer anywhere I like within the 4 measures allowed on the EM-1. Now I can stutter the Klee if I want. The sequences then get intense and it adds good change ups so things don't get boring. !! Sorry for not reply, I've been out for few days. I think that my original idea is been mixing with other ideas. My original idea was a simple clock source with the rate expressed in BMP. Is the same idea behind the "CV Standars" module, instead using a continuous frequency control, provide quantized pitch sources. I don't want to do any midi sync, firmware etc. Just control the clock rate instead using a continuous pot use two rotary Switch selector ( one for the tens and the other for the unis ) . Plus the two voltages and you will have the control voltage for the clock . I think that it maybe it could be made using same circuit that is on the on the "sample and hold" module but changing the control part for the TL071. As you can see is lineal relation between bpm and hz. The increase is 0.0166666 hz every bpm unit. this is quite basic then. The clock from the S&H is not suited for this kind of task but a simple 2 OPA linear VCO can be envisaged with trimmers for setting the various steps. Some thought on this idea. First, as it is time related and the clock signal is an oscillator, you want incredible temperature stability (at least when you use quantised volts). I think the only way to implement this stability (when not stable 120bpm is sometimes 118 and sometimes 122 or worse?) is to go digital. Like a digital controlled oscillator. And when you go digital, it's easy to implement a midi-clock too. Using a V/Hz analog VC-LFO is OK for temperature stability.